Orange County is where Americans love of amusement and theme parks began, although reasonable minds may differ on exactly which “Walter” fathered the industry – Walter Knott or Walter Elias Disney. In the 1920s, the Knott family sold berries and pies along State Highway 39. The highway was to become the main connection between Los Angeles and the beaches, and the restaurant the Knotts opened to help make ends meet became quite popular and often had a long waiting line. Walter Knott needed a way to entertain those waiting crowds, and his solution was to recreate a “ghost town” on the property using buildings he relocated from real Old West towns such as Calico, California. The Knotts didn’t actually begin charging admission to their park until 1968, so when Walt Disney opened his park – Disneyland – in 1955 (now part of the Disneyland Resort complex), they were not considered to be competing with one another. The two Walters had a cordial relationship, in fact, and even collaborated on community service projects from time to time. There are several Orange County amusement / theme parks today, including a couple of additions to the forerunners’ holdings. Balboa Fun Zone, Balboa Peninsula – Near Newport Beach, this park’s Ferris wheel offers breathtaking harbor and Pacific Ocean views. Disneyland Park, Anaheim – For most southern California tourists, this is the definite “must see” of all the Orange County amusement / theme parks. You can easily spend a whole day (or longer, if possible) at “the happiest place on Earth” and Downtown Disney, the adjacent 20-acre pedestrian promenade (non-gated, free admission) that offers dining, shopping, a multiplex cinema and several nightlife venues, including the House of Blues. Disney’s California Adventure, Anaheim – Adjacent to Disneyland Park but requiring a separate admission, this park celebrates the Golden State’s natural and manmade treasures. 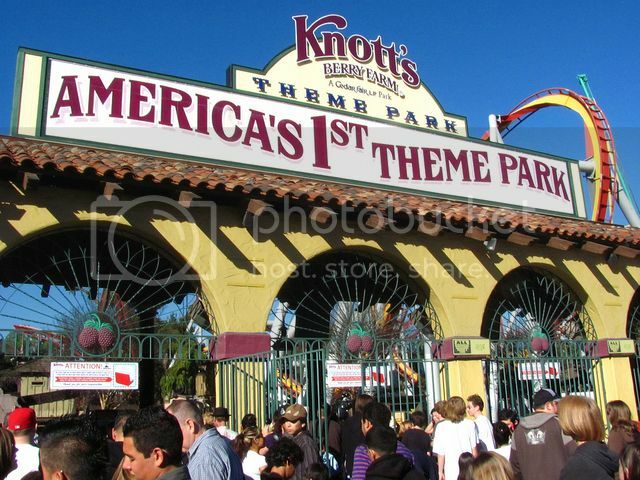 Knott’s Berry Farm, Buena Park – This large theme park offers more than 165 rides and attractions and an adjacent shopping district that you can visit for free. While the park does feature some “thrill” rides, there are several slower rides and an Old West and Peanuts characters theme that’s a winning combination for young children. Knott’s Soak City U.S.A., Buena Park – Open May through September, this water wonder world features rides, a family funhouse, a wave pool, inner tube rides and much more. If the Orange County amusement / theme parks aren’t enough to keep you busy, you might want to check out Southern California’s additional offerings: Los Angeles amusement / theme parks and San Diego amusement / theme parks. There’s no such thing as too much fun in California! Photo of Disneyland “Partners” Statue by wolves4moe via flickr (Creative Commons); Photo of Knott’s Berry Farm by Jeremy Thompson via flickr (Creative Commons).